Showcase your projects and submit them to RFPs, awards, magazines + more. See the world's best commissioned art as selected by our distinguished jury. 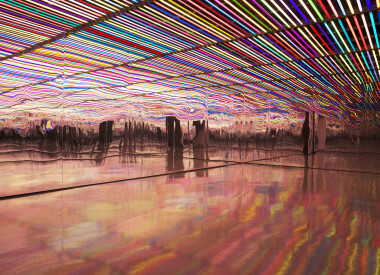 Attend our groundbreaking conference on The Intersection of Art, Technology + Place. Submit your projects to our online digital magazine, organized around a monthly theme. Watch the videos that tell the amazing stories behind commissioned art projects. Create a central Profile where all of your projects, images and information can be found. 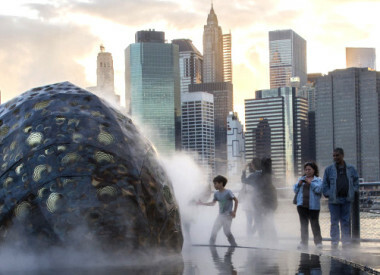 Discover global art commissions, organized by ten design categories. Hire expert collaborators for your next project, searchable by services and geography. Contact professional artists, designers, and creative teams in over 90 countries. Search by media, product, theme and color - from Creative Profile members. Save and organize your favorite works from throughout the site, and share with colleagues. Hire CODAworx to run your artist selection process, use the RFP Toolkit, or tap into our referral services. Post an RFP/RFQ. Highlight your expertise with projects that are viewed by commissioners and collaborators. Reach your target audience through our multiple sponsorship and advertising opportunities. Download our media kit. Create a portfolio of your projects and highlight your name in directory searches. 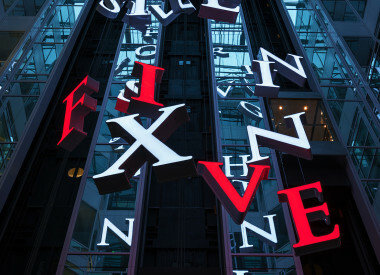 Apply to art commission opportunities from around the globe in the RFP Listings. Request a quote for all your logistics needs, including packing and shipping your artwork. Save time and legal fees. Use our standardized contract when hiring an artist or creative team. 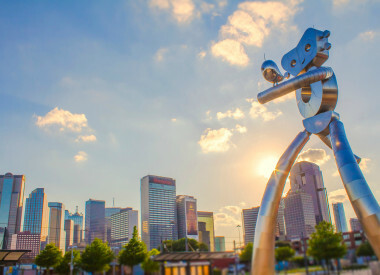 Protect yourself during the artwork installation process; get a free quote on general liability insurance. Blast, manage, and select finalists for your art commission with our application management tools. Request bids from a short-list of fabricators and industry resources. Discover what makes CODAworx unique, read our manifesto, and meet the team. Join as a Basic member, upload three projects, and consider becoming a Profile member. Read our latest case studies, design + art features, CODApresents, and more. Want to know How to Win the CODAawards? Move one step closer to winning the CODAawards! Fill in your email to receive a FREE white paper with tips from our jury. Please log in or register for free to write a comment. The goal of the Grand Reading Room is to make relevant - for today’s students - the role of the library as a palace for thought. The space creates a physical and inspirational framework for learning, designed to stimulate the senses and fuel the transformative process of education. 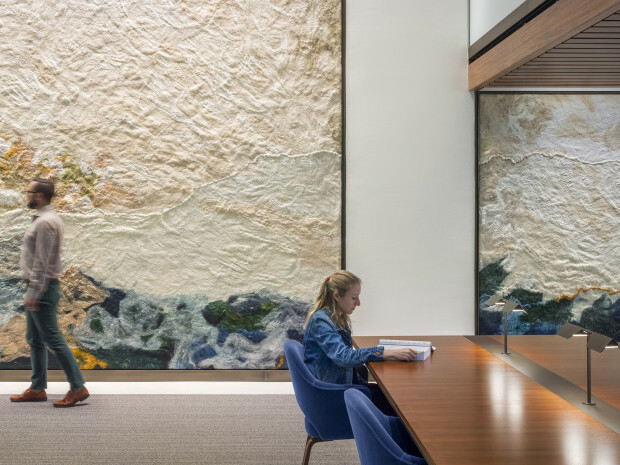 The light-filled volume is grounded by a monumental acoustical mural – the result of a year-long collaboration with artist Claudy Jongstra. 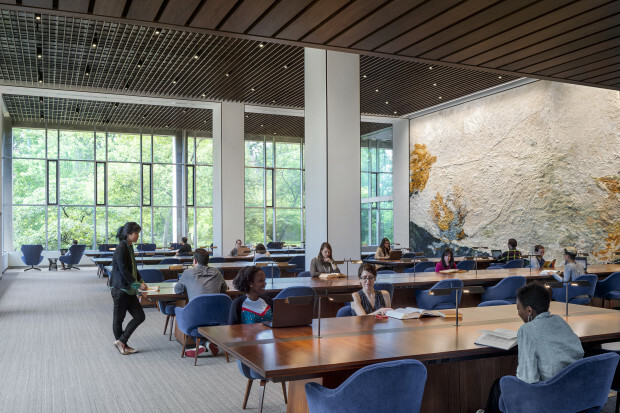 Accented with rich material textures of bronze, plaster and walnut, the culmination is a student experience that transforms the mundane chore of study to the sublime process of gaining wisdom. 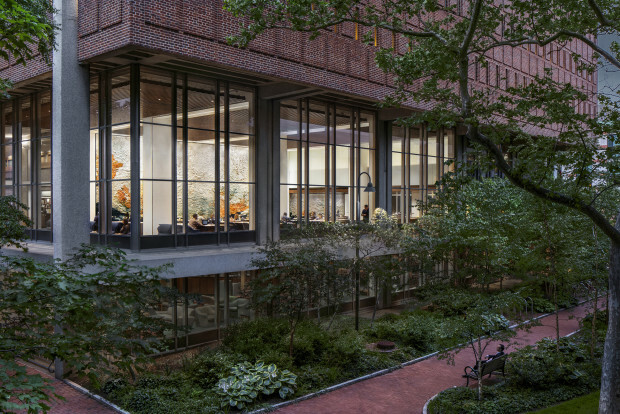 The Grand Reading Room is a seminal achievement towards realizing the University’s vision for a campus library complete with a reading room to rival those of the world's grandest libraries. This aspiration, paired with the critical technical requirement for an acoustic environment that would provide a pin-drop quiet, focus-oriented reading room necessitated a design intervention that could be simultaneously aesthetically grand and technically sophisticated. To achieve this, the design team commissioned a monumental acoustical mural to act as the grounding feature of the design. 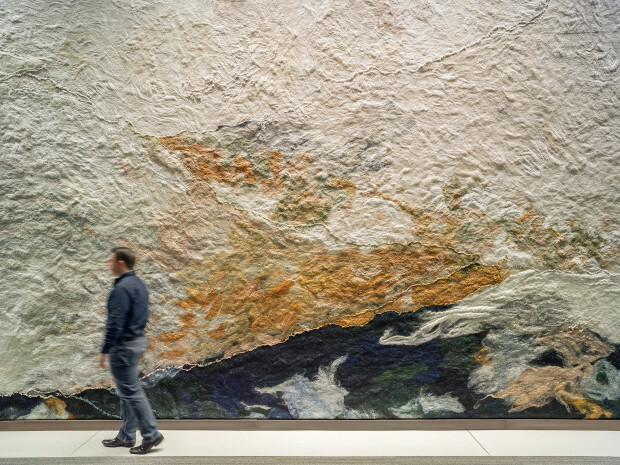 The artwork is fabricated from 100% renewable, acoustically absorptive materials - wool & silk - dyed with natural pigments – indigo & chamomile - that are grown on the artist’s biodynamic farm. 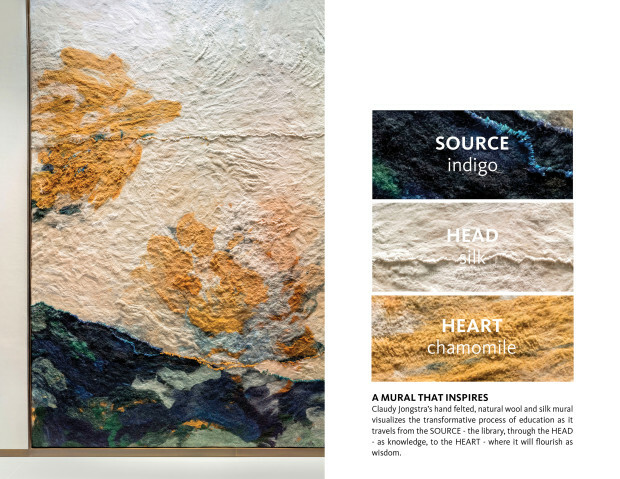 The abstract dance of colors and textures visualizes the transformative process of education as it travels from the SOURCE – the library, through the HEAD – as knowledge, to the HEART – where it will flourish as wisdom. Working with the artist, the 18’ x 53’ + 8’ x 23’ diptych mural complements the double height fenestration and transforms the entire room into an artistic composition that is devoted to inspiring academic achievement. The luminous space is now a beacon at the heart of campus. From initial project inception, the client and design team shared a collective design purpose – to create a modern-day Palace for thought to rival the Reading Rooms of the world's grandest libraries. The entire team understood the impact that an integrated art and spatial solution would have in telling the story of this unique place. From the early concept meetings, the team worked together to identify the artistic allegory, stylistic themes, color palette and strategies for placemaking within the footprint of the room. Though located in 2 separate countries, we corresponded multiple times weekly, crossed the Atlantic to meet in person to review custom samples for the project, consulted leading art conservators to assist with developing installation techniques and display details to fully integrate the grand scale artwork into the architecture. 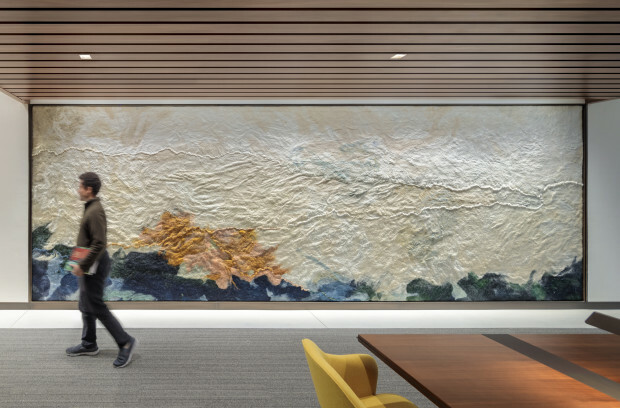 The team took care in selecting complementary architectural finishes that, like the texture and detail of the mural, add layers of detail and refinement that read differently when viewed from different distances. Hand-applied lime plaster provides a textured base that is framed by patinaed bronze details, and a meandering hand embroidered silk stitch weaves together the individual panels, which culminate in the final grand composition of the room. The rich color palette used in the mural is a revival of traditional pigments used by Dutch Renaissance masters. Roots, leaves, and petals from indigo and chamomile plants grown and harvested from the artist’s farm lend their distinctive color as natural dyes for the composition. The wool used in the mural is sourced from farm-raised Drenthe Heath sheep, Europe's oldest indigenous breed. Wool and silk fibers are hand-pressed together to form the felted texture. Together with the architectural material palette, which was coordinated with these natural dyes, the project’s color scheme is a complement to the surrounding historic campus landscape. © CODAworx 2019 - All rights reserved. Artworks shown on this website are copyrighted by the artists unless otherwise noted, and may not be reproduced without permission of the copyright holder. Art matters. Attention to the details of our environment leads to love of place, which brings us to take responsibility for the spaces where we live and work. And by extension, the people with whom we live and work. And by extension, to our local communities, our cities, our nations, and our world. We champion the role of artists in our society. We need artists to provide us with inspiration, creativity, and imagination, and to help us envision a better world. Architects and designers know that remarkable design can change everything. 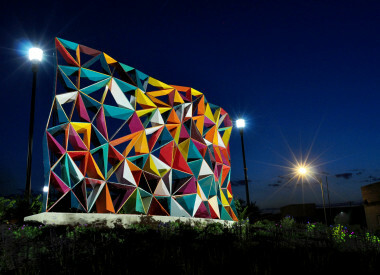 They connect the dots across disciplines, collaborating with artists to make the world a more beautiful place. They are the ultimate patrons of the arts. In the process, design professionals promote imagination and creativity, and through their commissions, make original art integral to and accessible in people's lives. 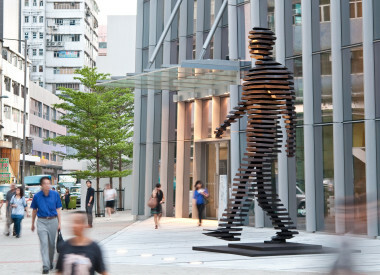 Art in our public and private spaces helps us fight ordinary buildings, ordinary streets, ordinary cities. We celebrate the extraordinary. The architecture of our buildings and the design of our interiors affect our happiness and well-being. Each of us deserves a daily dose of inspiration. You must register to make contact with CODAworx members, use design boards or post an RFP. Good news! Registering with CODAworx is free and simple. Click the button below to register or log in.